The most popular ‘People’s Choice’ award, Anugerah Bintang Popular BH (ABPBH) started in 1987. Back then, it was called Anugerah Penyanyi dan Pelakon Popular (APPP) with only seven categories contested. This annual award ceremony recognises professionals in the entertainment industry, including the film and record industry. BH readers will cast their votes for their favourite artists to fill the top five spots for each of the 16 categories including the Most Popular Artiste award. Series of road shows filled with fun activities involving the top five finalists were held in different states to promote the event. ABPBH helps at elevating the standard of local artistes and personalities to a higher level. Initiated in 2006 to recognize the achievement of students who have participated in BH’s three educational workshops; Klinik UPSR BH Didik, Seminar PT3 BH Minda and Seminar SPM BH Skor. Besides their academic excellence, students’ active involvement in co-curriculum activities is also taken into consideration. An intellectual discourse on various current issues and significant topics involving captains of industries, policy makers, top civil servants, prominent academics and NGOs. Acts as a platform to share information and views among forum’s audience in specific and BH readers in general. Started in 2016 and continued to be a popular public forum conducted solely in Bahasa Malaysia. The New Straits Times in partnership with Eco World organized this cycling event to promote a healthy lifestyle as well as to provide an additional platform for cycling enthusiasts to compete in this increasingly popular sporting event. Aside from the two cycling categories; 160km race track and 35km fun ride, some carnival-type activities such as food trucks, booth sales, clown and mascots from popular movie characters, were also held for parents and children who came to support their family members. NSTP started the first showcase in 2016 with the aim is to make NSTP as a leader in print media for property consultation. The event is the best place for the public to get firsthand information and latest property developers’ offerings, ranging from residential to commercial ownership or investment. It provides a platform for the public, especially first buyers, to purchase their dream home at affordable prices. The event also offers opportunity for visitors to gain in-depth knowledge about property and investment benefits from the industry experts on various subjects pertaining to home ownership, finance and housing loan. BH education unit conducts educational workshops targeted to students and teachers nationwide including the rural areas of Sabah and Sarawak. The examination seminars and workshops for students will help them to excel in public examination such as UPSR, PMR and SPM. The two-day programme provides students with the right, precise and effective techniques to answer questions for examinations. 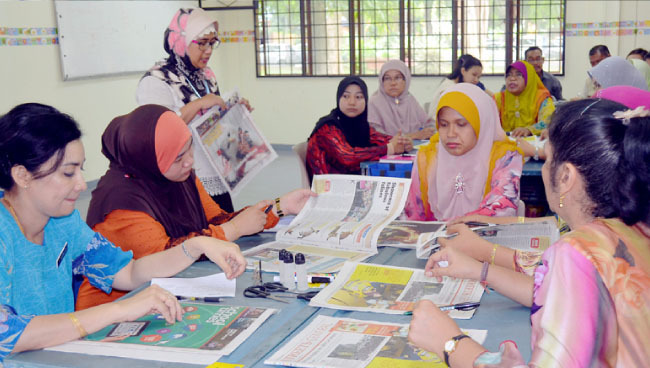 The ADD workshop is a programme designed for teachers in schools to use the newspaper as a classroom teaching aid. 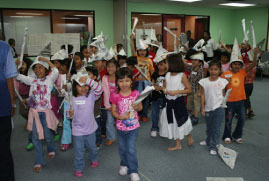 The workshop assists in the teaching and learning process in a more effective and interesting manner. The New Straits Times Newspaper in Education Unit (NIE) conducts workshops around the country for adults including teachers and children with the aim to enhance the language skills and spurred young minds to achieve educational excellence. Among the workshops held are school holiday programme for the children, news@work training and the inside scoop series. Activities include storytelling, public speaking, sizzle with science and creative writing while the teachers are taught how to use the NST newspaper to teach spelling, oral communication and writing to their students. It was first introduced in 2014 with the objective to enhance the increasing popularity of Muslimah fashion industries in Malaysia. Over 100 pop-up retailers and sponsors took up booths to offer products and services catering for this segment of society. The event also serves as a platform for local e-entrepreneurs to further promote their creation, brands or services to the open market. The Harian Metro Mountain Bike Grand Prix was introduced in 2013 with the objective to promote healthy lifestyle via mountain bike sports activity. Each year, the event is organized at different cycling circuits throughout the country. Since its inception, the event managed to attract over 13,000 participants comprising both locals as well as internationals from Singapore, Philippines, Indonesia, Thailand and Europe. 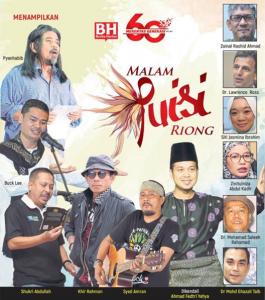 Malam Puisi Riong is a poetry reading evening by prominent poets, celebrities, editors and those who follow the literature pages in BH. Held since 1970s, it is named after Jalan Riong, the location of Berita Harian’s office in Balai Berita Bangsar. Beginning 1997, the event was spread to public universities. In 2009, Malam Puisi Riong began to adopt specific theme, with “Gelora Kemanusian’ as the theme for that year. This event aims to encourage not only the continuity of arts and culture, but also to deliver a message of patriotism, aspiration and appreciation for the homeland. In 2017, the chosen theme was ‘NegaraKu’, to support the government’s initiative to instil a sense of love for the country.